You’re Gonna Need An Even Bigger Boat: The Meg! 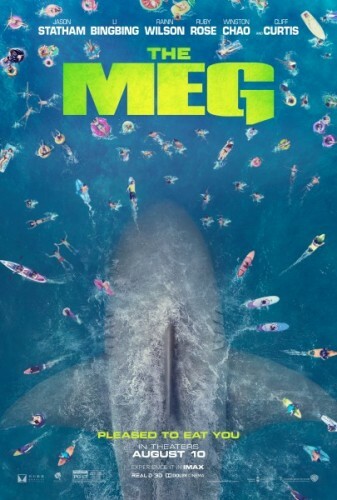 Warner Bros. has released a trailer for its shark thriller Meg. Based on the 1997 Steve Alten novel “Meg: A Novel of Deep Terror,” the film stars Jason Statham as a former Navy captain and deep sea diver attempting to rescue scientists trapped deep in the Pacific’s Mariana Trench by a 70-foot Megalodon shark. Meg is helmed by Jon Turteltaub (National Treasure) and co-stars Li Bing-Bing (Resident Evil: Retribution), Cliff Curtis (”Fear the Walking Dead”), Rainn Wilson (”The Office”), Masi Oka (”Heroes”), Ruby Rose (John Wick 2), and Jessica McNamee (”Sirens”).